the chairs are very nice, deep seat, comfortable. The white is bright, I paired with navy blue seat cushions, looks great. Order came as promised, everything was packaged great. Add a touch of classic elegance to your patio furnishings with this dining set. 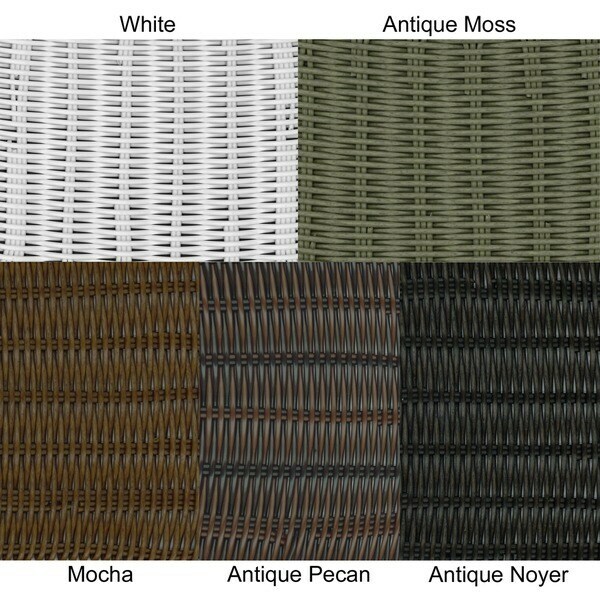 This set features an elegant resin wicker/glass top design, is built with a durable steel frame, and is available in a variety of striking color options. I love this outdoor dining set. I received it 2 days earlier than scheduled and this worked out very well, it was packaged very well, no damage. Easy to put the table together. It is on my glassed in back porch and it is beautiful. I know this is going to be enjoyed for many years. I absolutely love this dining set. It is beautiful, sturdy and comfortable. The only piece that required assembling was the table, and that was very simple to do. The only issue I had was that the wicker portion of the leg had either been cut in shipping, or had snapped, causing it to start unraveling. I fixed it with electric tape and notified customer service. It has nothing to do with the quality of the piece, just poor shipping and handling. I only gave this a 2 star rating. the pieces arrived in tact, on time and in good shape. however, if I had SEEN the product before hand, I wouldn't have bought it. the material used doesn't even match each other, table to chairs. there's a green tint to the chairs, that don't go at ALL, with the white resin rocker I have. Looks a little odd. maybe it will improve with time? I really doubt it. Arrived before schedule. This is sturdy and well made. Easy to assemble 100 percent satisfied with the table and chair.. Great for the deck. Received the patio set without any of the screws / bolts to put together. Customer service is going to give me an in store credit to cover the cost of screws and bolts. I do not intend to purchase from this manufacturer or Overstock again! "How is this a 5 piece set when it's listed as including 2 chairs and 1 table?" We are working on correcting this. Thank you so much for letting us know.